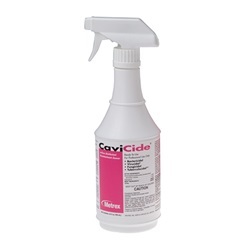 CaviCide multi-purpose disinfectant liquid in a 24oz. trigger spray bottle. Manufactured by Metrex Research. Effective against TB, HCV and HBV. It is safe for all areas of the facility including NICU, operating rooms, isolation rooms, patient care areas and laboratories. When used as directed, it will also effectively clean and decontaminate critical and semi-critical instrumentation. Comes as singles.